Journalists a regional daily arrived at work this week to find its office is set to be auctioned off. The Lancashire Telegraph’s Newspaper House office, on High Street, Blackburn, is due to go under the hammer next month with a guide price of £800,000. Telegraph journalists say they only found out about the proposed sale on Tuesday morning when a sign went up at the site. 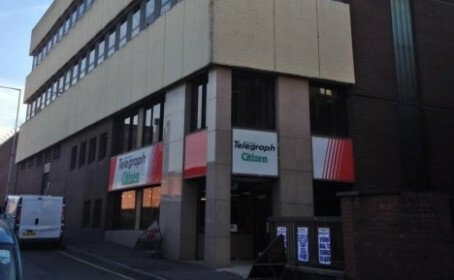 The Newsquest-owned Telegraph has been based at Newspaper House, next to Blackburn’s main railway station, since 1982. A potential office move has been mooted at the Telegraph for some time, with the four-storey office previously on the market for around £1.3m. No announcement about where staff will be relocated has yet been made. Editor-in-chief Ian Savage said: “This is just the latest chapter in the history of the Lancashire Telegraph. “In our 130-year history we have only ever been produced from two sites, both on Railway Road in Blackburn, so this decision has not been taken lightly. “Unfortunately though, our current building is no longer fit for purpose for us – it is just too big. But we firmly believe that remaining close to our readers and advertisers is key to our business and ongoing success. Chris Gee, Father of Chapel at the Newsquest Blackburn branch of the National Union of Journalists, told HTFP: “Staff have been aware through rumours and seeing property websites that the building has been up for sale for a while but were still surprised to see a notice of auction appear on the building on Tuesday morning. The property is listed on the Auction House North West website, with a three-month completion guarantee attached to the building. The auction is set to be held at 2pm on 15 December in the Platinum Suite at Bolton Wanderers Football Club’s Macron Stadium home ground. There off to Weymouth. After all, there will be plenty of space there, soon.